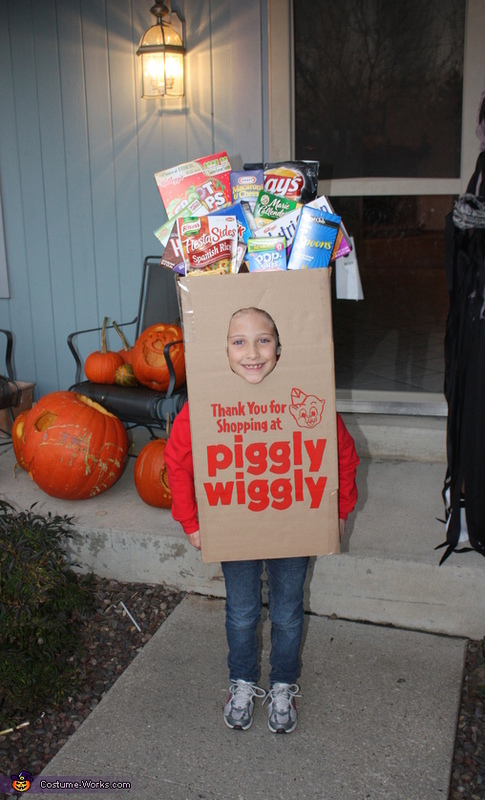 My 7 year old daughter Jessica is wearing her Piggly Wiggly grocery bag. This is one of the local food chains in our area. I took a box and cut out a face and arm holes. I painted the front and back with the identical logo from one of their paper grocery bags. I added a shelf above her head so I could glue the empty boxes from real life groceries onto it. She actually looked like a life sized bag of groceries. I do not remember where the idea came from. I just thought it would be cute and different. This is an amazing costume. SOooooooooooo original and a great promo for Piggly Wiggly. I loved it! Very creative and fun and I can't believe someone actually thought of this. So fun!!!!!!! !